The new series of coins will come into circulation starting April 30. The finance ministry had last month announced the rollout of the new series of coins, including that of Rs 20 for the first time in the country. The coins will be issued in denominations of Re 1, Rs 2, Rs 5, Rs 10 and Rs 20. The new series of Rs 2 and Rs 5 will be the first to be launched by April 30. It will be followed by Re 1 coins which will come in circulation by May 15. The coins of Rs 10 and Rs 20 will be rolled out by May 31. The value of currency keeps on depreciating. Earlier Rs 5 and Rs 10 coins were not there. The new denomination coins are introduced from time to time keeping in view inflation,” said a senior finance ministry official. Currently, the total value of coins in circulation stands at Rs 25,000 crore. “The old coins will be minted till the stock of raw material lasts. The old coins will, however, continue to be in circulation till they are worn out,” the official said, adding that the old series would not be demonetised. The new series coins would be easily distinguishable from old coins. Designed by the finance ministry, the coins will be minted under the Coinage Act at Mumbai, Alipore in Kolkata, Saifabad and Cheriapally in Hyderabad and Noida in Uttar Pradesh. However, the coins will be distributed or issued for circulation by the Reserve Bank of India (RBI) under the provisions of the RBI Act. The new Rs 20 coin has been given a dodecagon shape, which is a 12-sided polygon, with design of grains itched on it. The news series coins of denominations Re 1, Rs 2, Rs 5 and Rs 10 will be circular in design and will represent denominations written in Hindi script. These coins contain differentiating design features for visually impaired persons. According to the finance ministry, the Rs 20 coin will weigh 8.54 gram and its outside diameter will be 27mm with the outer ring made of nickel silver and the centrepiece of nickel brass. The face of the new Rs 20 coin and all other coins will bear the ‘Lion Capitol of Ashoka Pillar’ with ‘Satyameva Jayate’ inscribed below. The left periphery will have the word ‘Bharat’ in Hindi and the right periphery will have the word ‘India’ in English. The reverse side of the Rs 20 coin would have the denominational value ’20’ in the international numerals along with the rupee symbol. The year of minting in international numerals shall be shown at the centre of the left periphery of the coin. 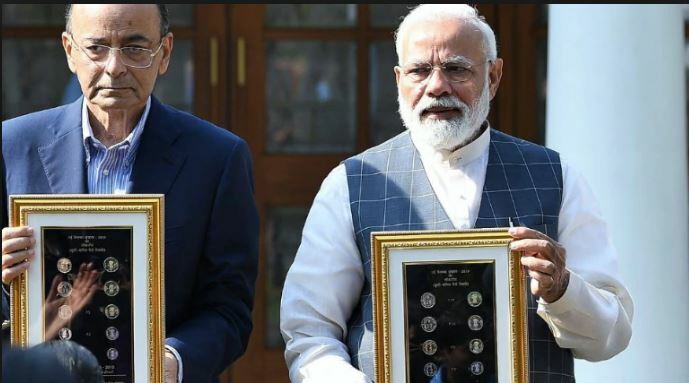 According to the notification, the new Rs 10 coin will have an outside diameter of 27 mm and weigh 7.74 gm, while the Rs 5 coin will have a diameter of 25 mm and weight of 6.74 gm. The new series one rupee and two rupees coin will weigh 3.09 gm and 4.07 gm, while the diameter would be 20 mm and 23 mm, respectively.